A Jump Guarder is an enemy that appears in Super Mario Galaxy. It is a green, spring-like robot that releases Topminis when Mario approaches it, and its head is able to be used as a Springboard, allowing Mario to reach greater heights. It bears a strong resemblance to a Spring Topman, both in appearance and function. The Jump Guarder appears in Super Mario Galaxy, showing up in the Buoy Base Galaxy. 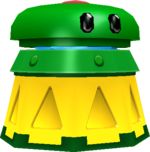 Only one appears in the entire game, and appears at the top of the Buoy Base, releasing Topminis from hatches on its sides when Mario approaches it. It is unable to be defeated by any means, but can be stunned by stepping on its head, allowing Mario to bounce off of it like a spring. ↑ Shogakukan. 2015. Super Mario Bros. Hyakka: Nintendo Kōshiki Guidebook, Super Mario Galaxy section, page 127. This page was last edited on March 27, 2019, at 08:21.